We’d love your help. 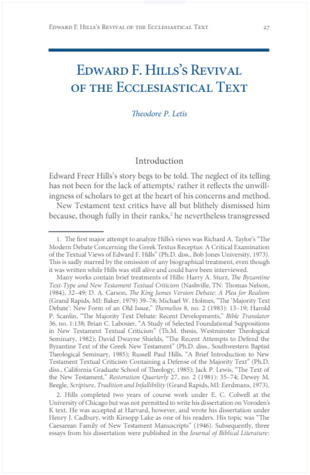 Let us know what’s wrong with this preview of Edward Freer Hills's Contribution to the Revival of the Ecclesiastical Text by Theodore P. Letis. This book comprises an excellent history of how the church has treated the text of the Greek New Testament since Reformation times. In Chapter 1 the author documents which text the Reformers used and how they handled textual issues, including variant readings. John Calvin, Theodore Beza, John Owen, and Francis Turretin are singled out as examples of the Reformation approac This book comprises an excellent history of how the church has treated the text of the Greek New Testament since Reformation times. In Chapter 1 the author documents which text the Reformers used and how they handled textual issues, including variant readings. John Calvin, Theodore Beza, John Owen, and Francis Turretin are singled out as examples of the Reformation approach to the text of the word of God. In Chapter 2 he deals with how the Princeton theologians handled these issues in the nineteenth century. Starting with Archibald Alexander, Charles Hodge, and Caspar Wistar Hodge, who basically maintained the Reformation stance (the latter less consistently) he then gets right to the crux of the issue, the views of B. B. Warfield. Warfield is shown to be the man who radically altered the church's views with respect to the text of the New Testament, introduced textual criticism to Princeton, and altered its views of both the inspiration of and the preservation of the text as set forth in the Westminster Confession of Faith. Warfield is shown as having both denied the historic doctrine of the providential preservation of the text of God's word and relegating the attributes of inerrancy and inspiration to the original autographs only, thus leaving the church without belief that it possesses an infallible and inerrant word of God. To ask other readers questions about Edward Freer Hills's Contribution to the Revival of the Ecclesiastical Text, please sign up. Good introduction to the issues surrounding the ecclesiastical text. E. F. Hills' contribution to the defense of the traditional text is incalculable. His life and contribution are worth taking note of.